Start your day off right with this quick and easy breakfast packed with fiber and healthy fats. Follow package directions to prepare instant oatmeal using water or low-fat milk. 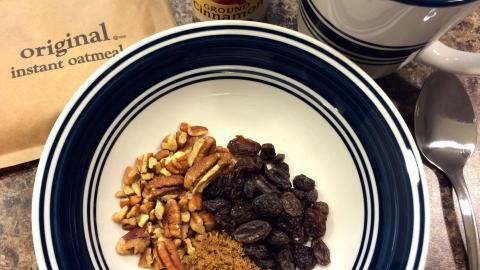 Add raisins, pecans, and brown sugar. Sprinkle on as much cinnamon as you like. Stir to mix well.